Why was Korea separated? Why have the Koreans been unable to overcome the line of demarcation separating them over the last 60 years? Why did the Korean War break out? 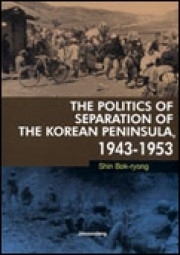 Many scholars studying contemporary Korean history have been conducting a detailed analysis of these very subjects. Traditionalists tend to place blame on the Communist Bloc, including Soviet Russia, while revisionists see the responsibility lying with United States’ anti‐communist imperialism. Throughout this controversial process, Korean scholars have been neglectful of a self in dealing with these issues. Based on historicism, this book considers at its core a series of tragic Korean historical events as civil or internal conflicts and aims to reflect on Korea’s own historical mistakes and errors. In this respect, this study can be categorized as being re‐revisionist. This book was written with the conviction that the Korean Peninsula was not divided by other, external powers but separated from within. 한국은 왜 분할되었을까? 한국은 왜 분단 60년이 지나도록 분단을 극복하지 못하고 있는 것일까? 한국전쟁은 왜 일어났을까? 한국 현대사를 전공하는 많은 학자들이 이러한 주제들을 분석하는 연구를 수행하고 있다. 전통주의 학자들은 러시아를 포함한 공산 진영을 비난하는 데 그 초점을 맞추고 있는가 하면, 수정주의자들은 미국의 반공주의적 제국주의에 책임을 묻고 있다. 이러한 논쟁과정에서 한국의 학자들은 당시 한국의 지도자들이 저지른 실수를 자성(自省)하는 데 소홀했다. 이 책은 역사주의에 입각하여 한국현대사를 바라보면서 그 당시 한국의 지도자들이 저지른 실수를 주목하고, 한국현대사의 일련의 비극을 내쟁(內爭)으로 풀이하고 있다. 이런 점에서 이 책은 재수정주의에 속한다. 한반도는 분할된(divided) 것이 아니라 동족이 갈라선(separated) 것이라는 점이 이 책을 관통하고 있는 논지이다. 1. Introduction: What is the Significance of the Term ‘Contemporary History’? 3. Points of View on the Separation: Causes or Responsibilities? 1) Were the Major Powers Responsible? 3) Anti-Colonial Trends in the U.S.
6. Conclusion: Who was Responsible for the Breaking of the Joint Commission? 1) Class Struggle or United Front? 2) Vanguard or the Masses? 5) Choice of the USSR: Native Communist or Overseas Communist? 1) Why did the North Korean Army Concentrate Its Forces to Attack Seoul? 2) Why did the North Korean Army Stay in Seoul during the Critical Three Days at the Beginning of War? 3) Why did Kim Il-sung not Value an Attack on the East Coast? 4) Why did North Korea Attach Importance to Light Equipment? 5) Did Kim not Relly Anticipate the Intervention of the Unoted States?